Many a film has been made of the back of real life tragedies and plenty have been delicately done, utilizing the cinematic art form to convey the sense of loss, triumph and guilt. Peter Berg is a director known for blowing things up in testosterone fueled films, such as Lone Survivor, and didn’t seem like the obvious choice to take on such a tragic storyline. The results, as one may have assumed, are mixed. No doubt Deepwater Horizon is an affecting film with strong performances across the board-especially a scene stealing Kurt Russell- but one has to wonder just how much greater the story could have landed had a greater visual talent been the main operator behind the scenes. Berg excels at creating break neck action sequences and the build up to the catastrophic on board events is justifiably tense but the film is weighed down by forced visual patriotism, heavy handed signs of things about to go south and a reliance of Mark Wahlberg’s character Mike Williams to be the sole standout hero in an event where there were many. 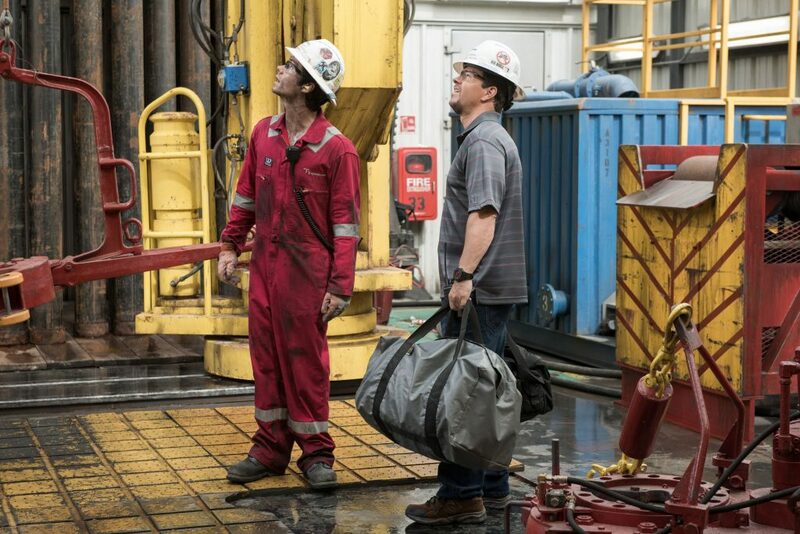 Based on the true events of the 2010 oil spill that to date is one of the worst environmental disasters of our day, Deepwater Horizon follows Williams on that fateful day and his interactions with the other blue collar workers who surround him, 11 of whom would loose their lives. The other spotlighted characters include Russell’s “Mr. Jimmy”, Gina Rodriguez’s Andrea Fleytas and Dylan O’Brien’s Caleb “Hollywood” Holloway. John Malkovich makes an appearance as a walking, talking campy accent as a BP rep who is willing to cut corners regarding safety protocol due to the rig being 40 days behind schedule, leading to the volcanic eruption that happens beneath the surface due to the build up in the piping. Malkovich aside, all of these actors deliver performances that feel authentically low-key, with Russell giving perhaps his liveliest performance in years. O’Brien and Rodriguez, both in underwritten roles, shine in their limited roles leading one to the belief that had the script decided to spread the wealth of material to more than just Wahlberg, then perhaps we would’ve had a more expansive story to dive into. As we are reminded in real life footage that bookends the film, these people were real and lives and livelihood were both lost so why does the film take such an egregious point of view in celebrating Wahlberg’s Williams as the one and only hero aboard who is worthy of such adoration at the end (and make no mistake, Williams is deserved of such praise) when those who lost their lives are given little spotlight? What allows the film to work as much as it does is that despite the bombastic action sequences this is a film of detail and it’s a story that feels stripped down in nature. There isn’t anything flashy or obviously attention catching in the opening 45 minutes of the film aside from poorly staged omens of what’s to come. Instead the dialogue is natural, the set intricately built and people very much real. There’s the thread of narrative that builds on the big company picking on the little guy and it’s one that stands out among the blaze of the explosion as the one that captures our interest and renews our belief that Berg could ever produce a film with a shred of subtly. The intention is there to honor the lives lost it just doesn’t fulfill its own promise that it made in the opening minutes. The action too is a stunning spectacle of whirring chaos that can be viscerally enjoyed if separated from the subject matter at hand. The honest confusion and disarray that the camera captures as one by one characters begin to realize that something isn’t right on the rig is beautifully capture and places the audience in the heart of the action so that we too can taste the mud, feel the heat of the frames and sense the panic of all of those on board. It’s a case of what might have been where if the original director J.C. Chandor (Margin Call, All is Lost) had stayed on board we might have been able to dutifully honor those who lost their lives due to overwhelming greed and corruption while simultaneously being caught up in the flight and fury of the eruption itself which toppled lives. Deepwater Horizon is a film that needed quiet moments. It needed a moment at the end to catch it’s breath and a focus beyond Williams and him being thanked where we could catch up on the lives of Mr. Jimmy, Andrea and Caleb who all experienced similar horror and managed to escape with their lives in tact. There needed perhaps more than just the motivation to tell a true story and honor the heroes and victims of said story but the compassion that would allow the telling of it to be nuanced. Wahlberg is fine in his tailored workman like persona that he plays so often and the supporting cast is superb. There is a version of this film that’s intense, evocative and stirring and during the first half Deepwater Horizon just about nails it. The last act needed time to be more than a taut action thriller and more of character study on what it means to be someone caught up in a catastrophe that was both out of their hands and one that could have been avoided, rendering the audience with an even greater sense of the pointless loss of life. We got the outline of something superb when what we needed was a full picture. Next ArticleTV Review: Arrow 5x01 "Legacy"